In an attempt to do something unique, a Russian TV anchor decided to propose his girlfriend on a live show. Yes, you heard it right! Not only he decided, he actually did this. 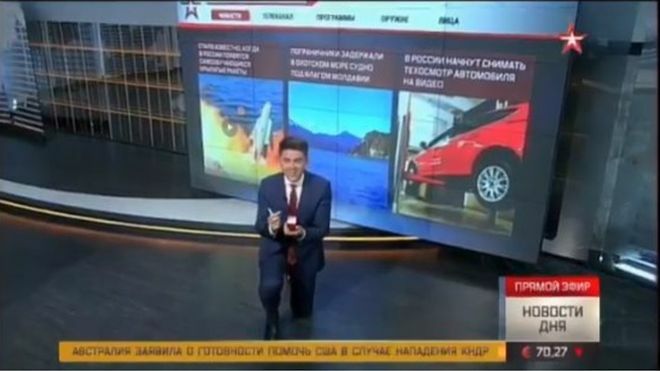 News anchor Denis Kochanov, the presenter at Zvezda TV, got up from his desk, pulled a red box out of his pocket and got down on one knee, faced the camera and finally proposed to his girlfriend knowing she was watching him on the show. Moreover, as per the reports, his girlfriend said “yes”.Zvezda (TV channel) is a Russian nationwide tv network run by the Russian Ministry of Defence.